Usha’s mum was a busy woman. She worked on the market stall selling the greens and fruit that grew on the family’s piece of ground. Usha was a dreamy girl. She went to the market to help her mum, but she preferred to watch everything that was going on around her. Her job was to look after the baby. When he cried she had to feed him. She had to make sure the flies did not settle on him when he was asleep. There was one customer who was her very favourite person. He was the mahout. She called him ‘the elephant man’. He used to come to her mum’s stall to buy his fruit and vegetables. He loved babies and would always tickle the baby under his chin and make him laugh. He was a very small man and quite wrinkled, and he could climb like a monkey because he was always having to climb up onto his elephants’ necks to take them to work. He used to like telling stories to Usha. One day Usha’s mum was cross with her because the flies were on the baby and he was upset. The elephant man turned up to find both Usha and the baby crying. “What’s this, what’s this?” he asked. “She’s a naughty girl. She’s not helping me with the baby. I need help, I can’t do everything myself!” said Usha’s mum. “Now, now, don’t cry any more. You cuddle the baby and I will tell you a story about my lovely most helpful elephant.” said the mahout. The elephant man climbed up on a pile of boxes and sat perched up on top with his legs crossed. Some other children noticed and came over to listen too. Everyone liked the elephant man’s stories. He spoke in a loud voice so everyone could hear. “I’ll tell you about Rani. When she was a young elephant her mum had a baby. Rani could tell that the baby needed lots of help. It was very small and could get trampled on by the bigger elephants. Rani always made sure that the baby was between her and its mum, that way Baby would not get squashed. The time came for Rani’s mother to get back to work. She had to pull logs on the plantation. She was taken out of the elephant compound and led away by the mahout. By this time Baby was bigger and eating grass and other green stuff. When he saw his mum disappearing into the distance, he started to trumpet as loudly as he could. His mother replied with one quick “Taraaa!” but she didn’t look back. She knew Rani was there to look after Baby. 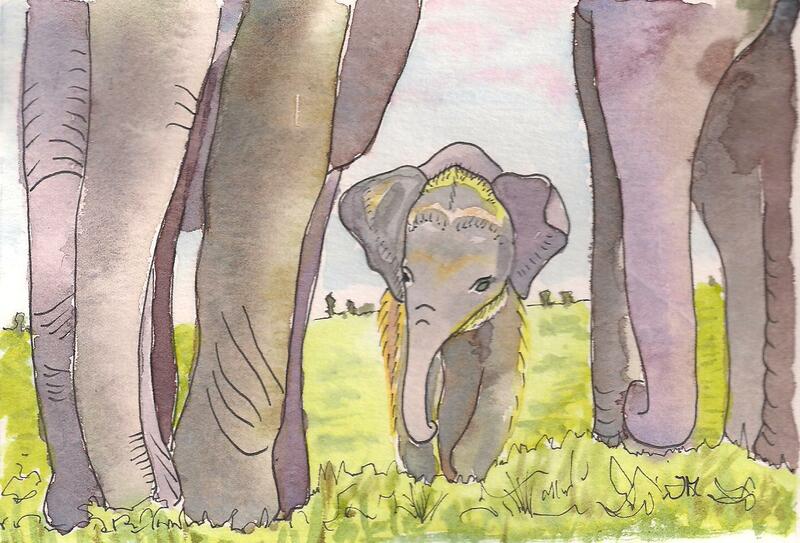 Rani laid her trunk over Baby’s back and gently rubbed him. Then she took some tasty greens and passed them to Baby. Baby stopped crying and ate a leaf. I was so pleased with Rani that day. I was in charge of all the elephants who were not working, and I was worried about Baby being upset when his mum went away. It’s not good having upset elephants. 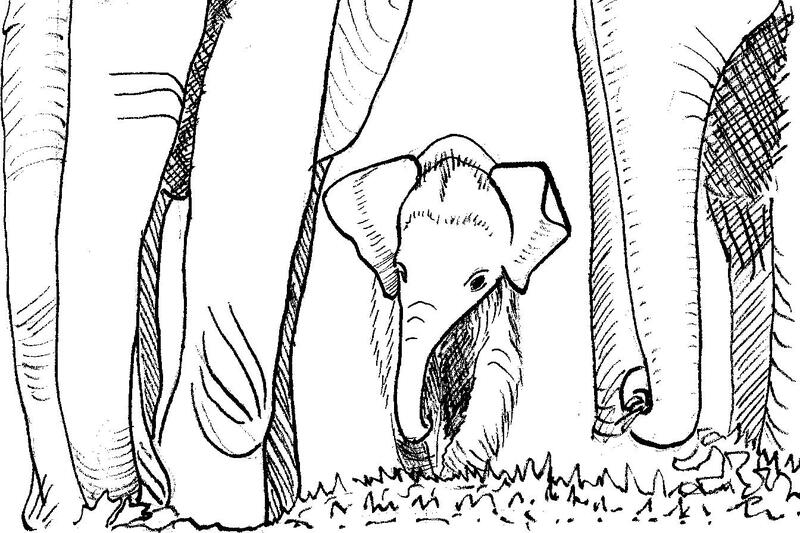 I did think that as Rani was such a helpful elephant, she would probably look after her little brother, and I was right. All the elephants stayed quiet and calm that day which was a good thing for me, don’t you think? And what about you lot, are you helpful to your mums and dads? I hope so!” said the mahout as he looked round at all the children. With that he picked up his sack of vegetables and disappeared between the stalls. Usha thoughtfully rocked the baby who was smiling now. “I want to be as helpful as Rani,” she said to her mum. “That’s very good to hear, Usha, and I’m sure you can be!” said her mum. was it Usha, Rani the big sister elephant, or the elephant man? Do you try to be helpful? How? If you are helpful to others, do you think they might be helpful to you? If you are not helpful, do think others will feel like helping you? What would it be like if nobody was helpful? What would it be like if everyone was helpful? I love this story! It has had 14,000 readers so far, and lots of comments. This story is very good and interesting.People would learn to help others. This story is about helpfulness. I like this story. It’s really a great and helpful piece of info. I am satisfied that you simply shared this useful info with us. Please stay us up to date like this. Thanks for sharing. Thanks Alex, I like it too! Can’t say whether it’s true, he claims that it is! It’s a wonderful collection of stories anyway. Hey we are doing a essay on Elephant man at school. I was wondering if this is an original story, or if a famous aurthor wrote this. If it is writen by a real author is this a well known story? Well Chris, I wrote The Elephant Man. Not sure if you would consider me to be a ‘real author’! I had never heard the story before I wrote it, and it came to me when I was meditating and asking for a story about ‘being helpful’. I have written about 200 stories. They all come to me when I ask for a story on a particular subject while I am meditating. Many of them are on my blog that you found. Does that answer your question? I am a teacher, but I don’t teach people how to write stories! Perhaps you could try writing in that way. Just sit quietly where you will not be disturbed and holding a pen in your hand and have paper to write on. Just ask the Universe for a story on your subject, and see what you write. Don’t hesitate, just write. I never plan my stories and sometimes I don’t even understand them until I read them back to myself after I have finished. That picture of the baby elephant is lovely. We had a story at school of an elephant. A little boy threw a stone at it and ran off. No one saw it. But later the mahout would observe that whenever the elephant was to be fed, it would take a stone out of its mouth and then put it back after it’s fed. After a while the mischievous boy came that way and the elephant threw the stone right back at him! Your nice story reminded me of it.